Combining a sleek design with high performance technology, Swiss watchmakers Breitling present the Colt Automatic men's timepiece. Featuring a crisp cream dial with date aperture at the 3-o-clock position, highly visible indices, stainless steel unidirectional ratcheted and rotating bezel, glareproof sapphire crystal, and complete with a smart brown leather strap. Water resistant up to 200 metres, the ideal watch for the modern man who demands more from his accessories. 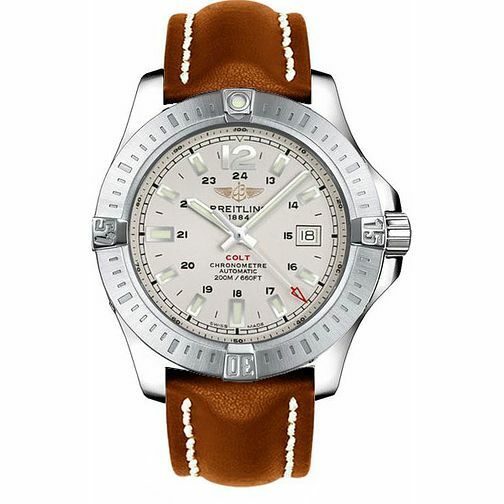 Breitling Colt Men's Brown Leather Strap Watch is rated 5.0 out of 5 by 1. Rated 5 out of 5 by Anonymous from Neat watch, great price Picked this watch up from Bull Ring shop in Birmingham. Could not fault it in any way. Lovely feel, looks excellent on wrist. 4.4 cm face is a nice size, face colour very nice and goes with the brown leather strap. Service at the Bull Ring shop excellent, no rush, nice coffee, very friendly staff. 3rd watch from this shop. But the Colt is my new top watch. Always wanted a Breitling watch.